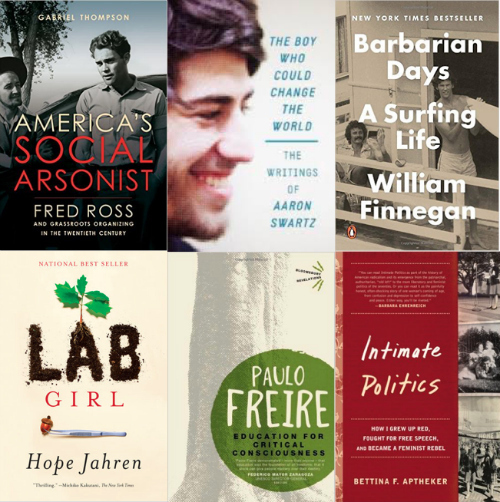 These are some of the titles selected by students, staff, faculty, and alumni for the second annual Social Sciences summer reading list. “Rebels and Visionaries” is the theme for 2016, inspired from the division’s Dream is Still Alive video. We asked students, faculty, staff, and alumni from the social sciences to share a book about an inspiring person or a provocative idea, a social movement or an influential leader. Who questioned authority? Who pioneered a bold concept? Who sought social, political, economic, or environmental change? The suggestions form a rich collection that crosses disciplines and spans decades. Chancellor George Blumenthal recommended Go East Young Man (Random House, 1974), the memoir of U.S. Supreme Court Justice William O. Douglas’ pre-judicial life. Sheldon Kamieniecki, dean of the Division of Social Sciences and a professor in the environmental studies department suggests Rachel Carson’s Silent Spring (Houghton Mifflin, 1962), one of the first books to raise awareness about environmental problems to a wider public. Others recommendations include recent Pulitzer prize winner Barbarian Days: A Surfing Life, by alum and now New Yorker writer, William Finnegan (Cowell, '74, English literature) and Saving Capitalism by former U.S. Secretary of Labor Robert Reich,who spoke to the UC Santa Cruz community earlier this year about politics and capitalism. Distinguished UC Santa Cruz professor Bettina Aptheker’s memoir, Intimate Politics: How I Grew Up Red, Fought for Free Speech and Became A Feminist Rebel was also suggested for its relevance today. Additional suggestions acknowledge the previous generation that helped inspire the next. "When I was a graduate student, I didn’t have any female scientist role models, so I have always enjoyed reading accounts of the different paths women have taken to succeed in science, says Karen Holl, professor of environmental studies about her recommendation, Lab Girl (Penguin Random House, 2016) by Hope Jahren. Other notable figures on the list include grassroots community organizer Fred Ross, internet activist Aaron Swartz, and critical pedagogy advocate Paulo Freire.